By Chris Williams: Manny Pacquiao (56-5-2, 38 KOs) and his trainer Freddie Roach both are very interested in a future bout against WBA/WBC light welterweight champion Danny Garcia (29-0, 17 KOs). Roach sees Garcia as the perfect opponent for Pacquiao due to the way Garcia loads up with his left hooks, and swings for the fences each time he throws a punch. Roach thinks Pacquiao would do well against a fighter like Garcia. Pacquiao’s promoter Bob Arum, however, doesn’t think Garcia could even beat Chris Algieri (20-0, 8 KOs), who will be facing Pacquiao next on November 22nd in Macau, China. Arum thinks Garcia would be out of his element in a fight against the 5’10” Algieri. “I don’t think Danny Garcia, if he fought Algieri today, he wouldn’t have much of a chance. Algieri is a great athlete,” Arum said to Radio Raheem. This could be Arum’s way of promoting the Pacquiao-Algieri fight by making Algieri out to be a really good fighter, which he definitely is. Algieri isn’t much of a puncher, and Garcia would have 12 rounds to find his chin with one of his big power shots if that fight were to take place. Algieri did a good job of beating Ruslan Provodnikov last June, but that was mainly because Provodnikov was throwing one punch at a time instead of throwing combinations. 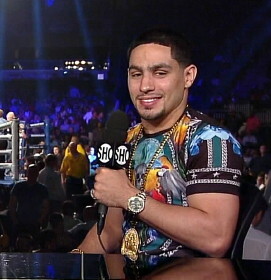 Danny Garcia loads up on single shots just like Provodnikov. However, Garcia is a smart fighter with an excellent trainer in Angel Garcia. He’d likely make adjustments in a fight against Algieri by throwing a lot of combinations in order to land his shots. Pacquiao might not ever get a shot against Danny Garcia, because he has Al Haymon as his adviser/manager, and that could keep them from ever fighting unless Haymon sees the Pacquiao fight as one that he’d like to make. I don’t think that’s going to happen. Arum probably has a good idea whether a fight between Pacquiao and Garcia is one that has a realistic chance of taking place. It’s quite possible that by Arum saying that Garcia wouldn’t have much of a chance against Algieri, he’s basically saying it’s a fight that couldn’t take place between Pacquiao and Garcia.